We’ve all had those customer service experiences that really provoked us, whether it was because of horrible service at a restaurant, a faulty product or poor customer treatment. When customers feel their complaints are not heard, they don’t give up. People take to social media to voice their complaints. In his article on Mashable, author Harry Rollason stated that at the end of the 2012, 80 percent of American companies planned to use social media as a customer service tool. Social media allows companies to manage complaints and taking control of the situations, seemingly as they happen. Yet in some cases, companies choose to ignore complaints, which can encourage more frustration from customers. If a company chooses to ignore customer complaints, those who were ignored might tell their friends about the bad experience. They could also voice their concerns on social media, and in some cases, those concerns spin out of control for companies. Dave Carroll, mourning his guitar. 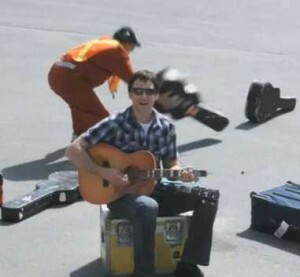 In the most bizarre case, poor customer service led to the infamous “United Breaks Guitars.” In 2009, Musician Dave Carroll saw United Airlines baggage handlers tossing around his guitar case and soon realized it had been damaged. He told United that the baggage handlers had broken his Taylor Guitar. When United wouldn’t respond to Carroll’s complaint, he wrote his famous song that, to this day, has over 13 million views on Youtube. After Carroll’s song went viral, it caused United to take action before it brought even more harm to their reputation. Though Carroll’s song succeeded because of his talent and unique spin on bad customer service, a situation like this is always something companies always want to avoid. As I see it, businesses want to ignore complaints on social media because they don’t want the conflict to go any further. But doing this could still lead to more bad reviews and even harsher comments. Like the case with United Airlines, responding to a customer’s complaint in person could have saved them time and energy dealing with social media. In the end, businesses have set social media plans in place to deal with customer service complaints. For more from Innovative PR, be sure to follow Innovative PR on Twitter, “like” us on Facebook and Pin with us.